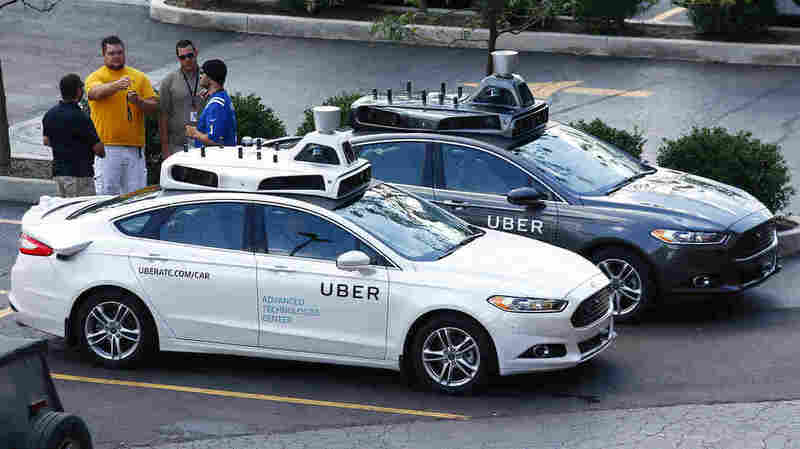 Uber To Roll Out Self-Driving Cars In Pittsburgh : The Two-Way The ride-hailing company expects to include a human in case something goes wrong, but the driverless vehicles would be the first available for commercial use. They could be on the road in a few weeks. Uber is plowing ahead with its ambitious plan to make self-driving cars a reality. The company will run an experiment in Pittsburgh, rolling out the first-ever self-driving fleet that's available to everyday customers. Uber won't specify exactly how many self-driving cars will hit the streets. But in the next few weeks, if you're in Pittsburgh and use your app, you might land in one of them. "Pittsburgh is going to have some self-driving car tourism. That's exciting for them," says Bryant Walker Smith, an assistant professor at the University of South Carolina who monitors law and policy developments in autonomous technology. An Uber staff member (an engineer or specially trained driver) will be inside, as the human co-pilot. So, to be clear, it's not a car without a human. "If we were putting this in terms of a tightrope walk, there would definitely be a net," Smith says. Self-driving cars — whether Tesla Model S or Google cars — are easy to spot in the San Francisco Bay Area. In other cities, even though they are on the roads, they're less visible. And to some people, they're scary. Earlier this summer a man died in a Tesla that crashed while on autopilot. "Going to the public, and involving them in that conversation, making a safety case for the technology in a very direct, visceral way, is going to help the broader, public perceptions of these systems," Smith says. While Uber's message to passengers is friendly, the one to the company's drivers is less so, according to Smith. "It's not every day that a company so publicly and aggressively and openly says 'we want to replace our workforce. We want to put people out of a job. We want to put our people out of a job.' "
Uber has 1.5 million drivers worldwide, 600,000 in the U.S. Asked what the message is to drivers — people who might hear this news and worry about their livelihood — Uber says in an email to NPR that self-driving cars are a ways away; a hybrid vehicle that is self-driving, but also needs a human, will likely win; and that human drivers will probably be necessary for tough routes (e.g., winding country roads) if the technology hasn't evolved. Steve Shladover, an engineering professor at the University of California, Berkeley, puts it at 60 years. Andrew Ng, a leader at the Chinese tech giant Baidu, is far more optimistic. He says there will be cars that need no human hand-holding by 2018 for commercial purposes (like food delivery), and by 2020 for the mass market. Baidu has just partnered with Ford to work on autonomous tech. Shladover is skeptical. "There is a marketing war of words going on right now because each company wants to give the impression they're more advanced than anybody else," he says. In a recent essay in Scientific American, he argues the industry is churning out hype and has big hurdles to overcome to get self-driving cars to be as safe as human drivers. Rajkumar says the Uber cars will have a lot to learn about local roads and quirky customs like the so-called Pittsburgh left turn: When cars are at a traffic light, the light turns green, and you are the first car in line that wants to turn left, he explains, "you basically get to [go] first, before vehicles going straight from the opposite direction." It's only the first left-turning car — not the others, just the first. He says the self-driving car will have to program in that fact, and maneuver the city's many bridges and snowy winters.